How do i transfer a dvd to Android Phone and Tablet? Android accepts various video formats H.264, MPEG4, WMV, AVI, MOV, 3GP, etc. However, it cannot play DVD directly. So if you want to open or play a DVD movie smoothly with your Android-powered mobiles and tablets like Samsung Galaxy Tab/Note/S series, HTC, Kindle Fire, Google Nexus, LG, Sony Xperia, Nook HD, etc. This article will introduce one pratical solutions to watch DVD on Android Phones or Tablets. What you need to do is to rip DVD to Android compatible video formats. Android accepts various video formats, like H.264, MPEG-4, MP4, WMV, AVI, MOV, 3GP, etc. So a DVD to Android ripper is badly needed. Though there are a number of devices available on the Net, most of them are quite costly and the free ones can be difficult to use. But one efficient and inexpensive program to transfer DVD to android tablet is the Pavtube DVDAid for Mac OR Pavtube DVDAid. Here is quick look at how this program works. The Best DVD to Android converter is in all-encompassing media tool that lets you convert DVD to Android tablet or phones. So, you can play your DVDs on any of your android devices. It can be used to convert videos to pretty much any required format. You even have complete freedom to burn, copy or edit any of your favorite videos. It goes far beyond simple conversions. You can use it for pretty much any multimedia functions. Ripping all DVD movies to any Android devices (Samsung, Amazon Kindle, Nabi, Hudl, Surface, Google, Nokia, HTC, LG, Sony, Surface) etc supported digital formats. Making DVD digital backup copies to prevent DVD discs from loss and damage, and facilitate convenient storage and finding of DVD movies. It can rip homemade DVD or commercial DVD encrypted with CSS encryption, region code, Sony ARccOS, UOPs, APS, RCE, etc. Supports almost all popular mobile devices like Android, iPhone, iPad, iPod and more. 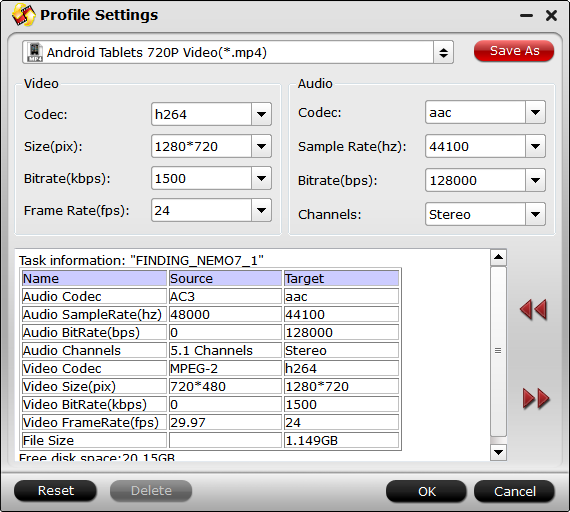 Extract the audio and video content of DVD to a digital video file playable by Android tablets and smartphones. 500% conversion and multi-threading process to speed up the conversion. Install and launch the top DVD to Android Converter. Click the “DVD” icon to load DVD movie. After the DVD files are loaded, you can preview them on the right viewing window and take snapshots of your favorite movie scene. ISO and IFO files are also supported. Select an Android friendly format, e.g. H.264 .mp4 for conversion. Basically the “Common Video -> H.264 Video (*.mp4)” is a universal format for Android tablets and smartphones. Besides, there are optimized formats for Samsung, Motorola, Acer, Asus, Sony, Toshiba, HTC, etc branded Android devices; choose a proper one as you need. 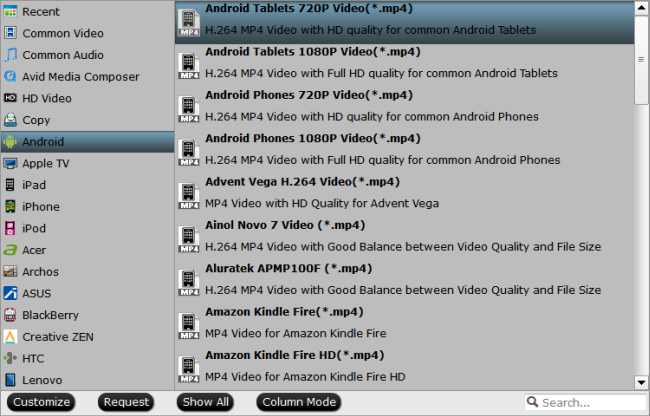 Or depends on your device, you can choose a suitable video format from “Android” catalogue. When all the settings are OK, click “Convert” button to start converting DVD movies to MP4 video for playback on Android tablet/phone at ease. When the conversion is over, click “open” to locate the ripped video files. After that, you can connect your Android phone or tablet to computer via a USB device and transfer the videos to your device for enjoyment on the go.